A much easier to understand timetable, mainly because there are a lot less options. 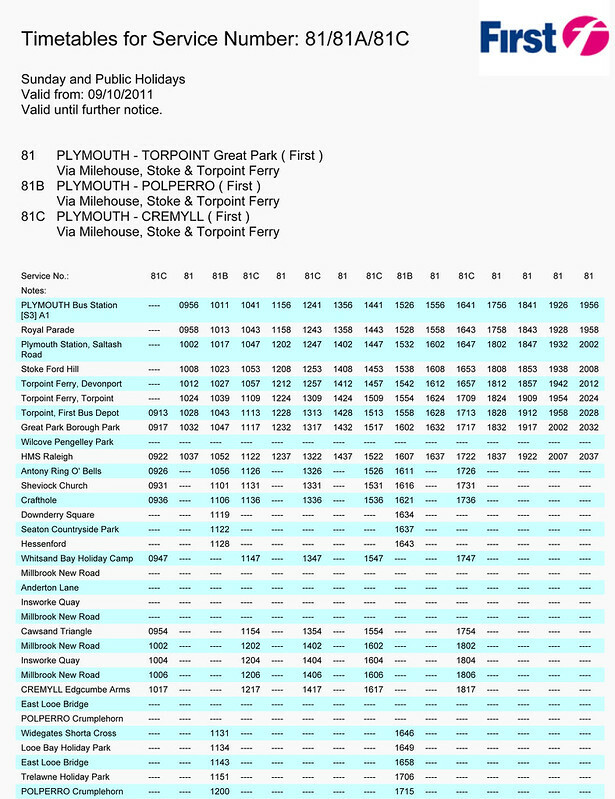 The Polperro 81B journeys have gone and now everything is just run as service 81. 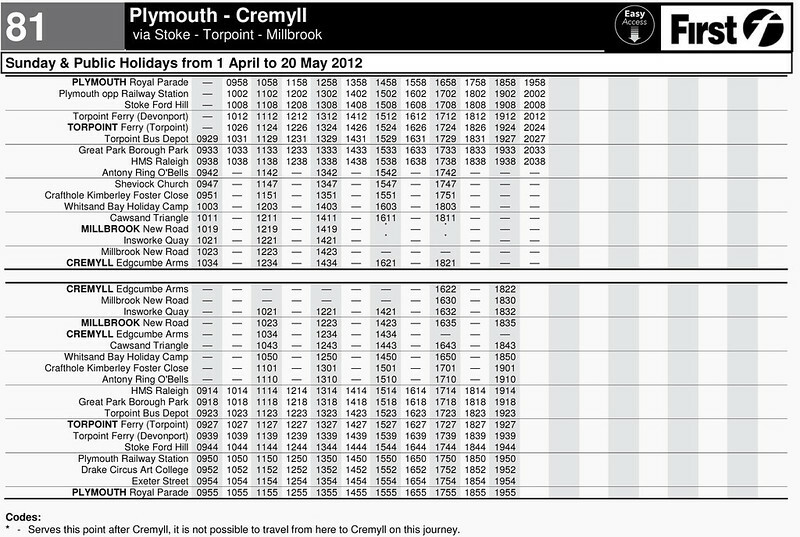 The clock face hourly departures from Plymouth to Torpoint make it a lot easier to remember the bus times. Its still a shame to see the summer Sunday service is reduced from the winter Sunday service. When I first saw this I thought that the runs to Cremyll had all but disappeared. I saw the outward runs in the top half and Cremyll only seems to be served at 16:20 and 18:20. On closer inspection Cremyll is still served just as often, but you need to look down to the inward section below to see the full picture. I can see potential passengers viewing this timetable and having the same initial reaction as I did. Having said that the changes seem fairly minor. So there we have it. The current Sunday timetable in a nice easy format for all to see. 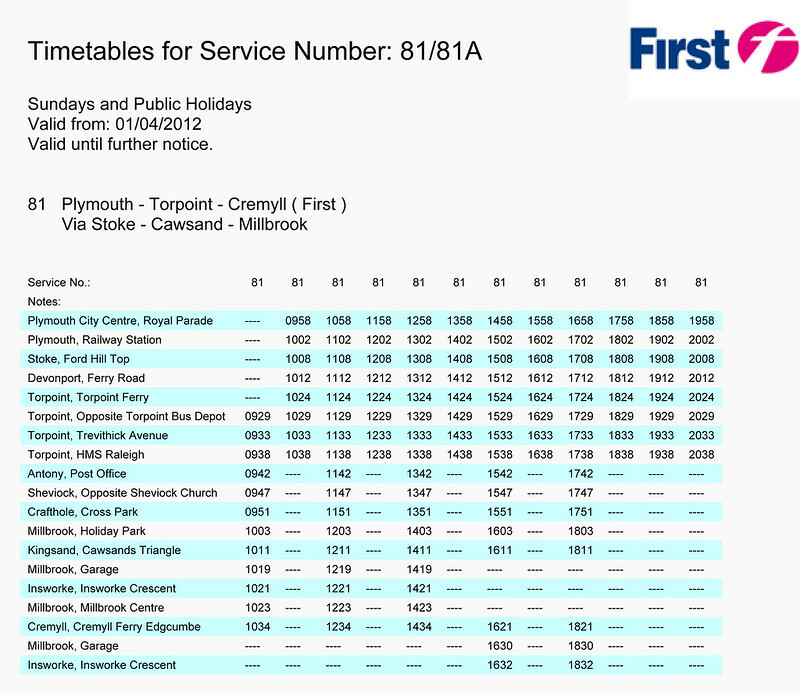 Apart from one minor issue – despite First having announced the timetable would change and linking to the rather poor pdf shown above, if you click through on their current timetables through to the Sunday service for the 81 – it still shows the position as at 1st April. There is not even anything under forthcoming timetables! Its not easy being a bus passenger is it? 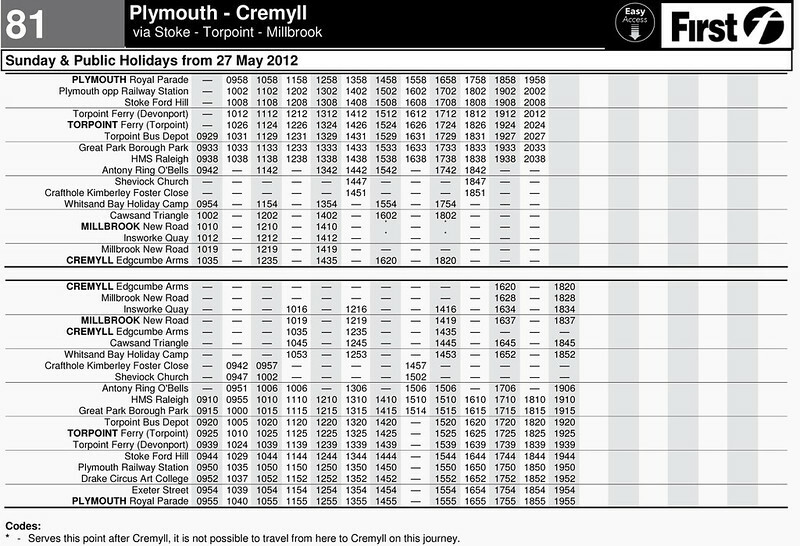 It never ceases to amaze me that bus companies should be satisfied with such poor timetable presentation. The problem is the usual. They use computers! And computer systems are really really bad a handling overlapping loops. Clearly the folk at Kernow are using their brains - much better than any confuser system. Although the links to Cremyll are there allowing FDC to 'tick' the box, the outrage from users is that these services are actually very unusable. This isn't just because of the timings meeting the Cremyll Ferry in which they leave either 2 minutes too early, for anyone to use on the 'terminating' services to Cremyll, but that on these services, there are only 2 links from Cremyll to Millbrook that you are effectively able to use. They seem to have now tried to cover this up by calling Whitsand Bay Holiday Park, 'Millbrook Holiday Park'. Using a simple Google Maps search, we find that its a distance of 1.3 miles, and a walking time of 25 minutes to reach the village centre, let alone getting to Insworke where a majority actually live, in which it takes 35 minutes, to walk the 1.8mile distance. Why they can't revert back on the Sunday to terminate properly in Cremyll is beyond me, and indeed if they used sensible sized buses i.e Dennis Darts they could cut the journey time by using the Anderton road, in which the Tridents cannot negotiate, presuming that journey times are their reasoning behind this madness. Saw a Citybus double deck running around in Torpoint this week with on test on the front. Dunno what was going on. 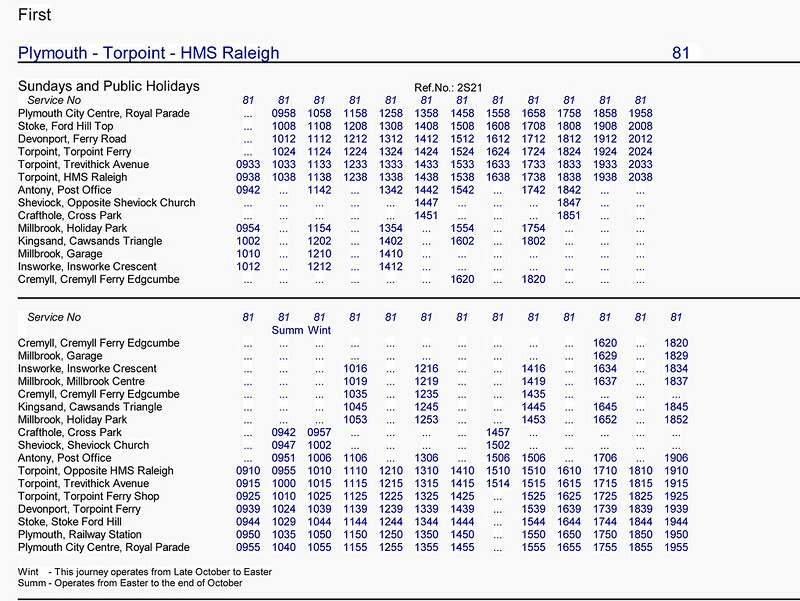 I never see anyone using the Torpoint services, are they used? Laurence, the reason its called millbrook holiday park is because they use the official designation of the bus stop, if you type in millbrook holiday park and look at google maps you'll see its the name of the busstop outside of the whitsand bay holiday park, its as simple as that, as a driver we have weird things like this on our dutys, for example on the x80 on our duties it says Ellacombe Torbay Hotel in Torquay, who's ever heard of that!